Welcome to robschumaker.com! I hope you enjoy your visit. Dr. Robert P. Schumaker is an Associate Professor of Computer Science at the University of Texas at Tyler, the George W. and Robert Pirtle Endowed Professor of Business, Founder and Director of the Data Analytics Lab, Associate Editor of Decision Support Systems (DSS) journal and speaker through the ACM Distinguished Speakers Program. 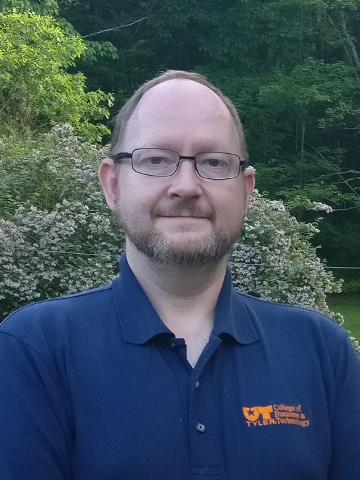 Dr. Schumaker is an accomplished data science researcher with over 50 publications and a g-index score of 38; measuring scientific productivity based on published articles and citations. His research in data science deals with building predictive systems in the areas of finance (stock price prediction), sports (sports wagering prediction) and medicine (adverse drug event prediction). Dr. Schumaker is an internationally recognized scholar whose research has been featured in MIT Technology Review, The Wall Street Journal, Slashdot, Axios and many other media outlets. Dr. Schumaker has also provided keynote addresses to conferences such as Discourse Approaches to Financial Communication (DAFC-2014 Switzerland), International Symposium on Computer Science in Sport (IACSS-2017 Germany), IEEE International Conference on Advances in Big Data, Computing and Data Communication Systems (icABCD-2018 South Africa) and numerous other engagements through ACM for the US Army Corp of Engineers and various universities worldwide.